Product #16754 | SKU MBX6 | 0.0 (no ratings yet) Thanks for your rating! 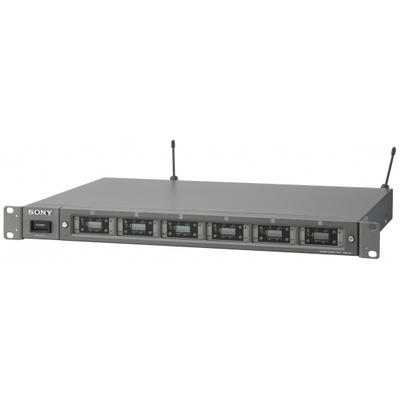 The Sony MB-X6 UHF Tuner Base Unit features a modular design that conveniently accommodates up to six WRU-806A and URX-M1 tuner modules. Up to six transmitters may be used simultaneously with six tuner modules installed. The rear panel provides six XLR (mic/line selectable) outputs and a stereo mix output. The MB-X6 features a single 42.3 cm rack space design and operates on channels 30 through 69. This MB-X6 tuner base operates in UHF-TV channels 30 through 69. WL-800 series wireless systems are compatible. Up to six WRU-806 or URX-M1 may be installed for simultaneous operation of up to 6 wireless transmitters. Built-in antenna divider sends an amplified signal to all six channels with optional AN-820A antennas. An antenna gain switch adjusts antenna sensitivity to prevent overload of antenna section of receiver. Selects mic or line operating level for all outputs.